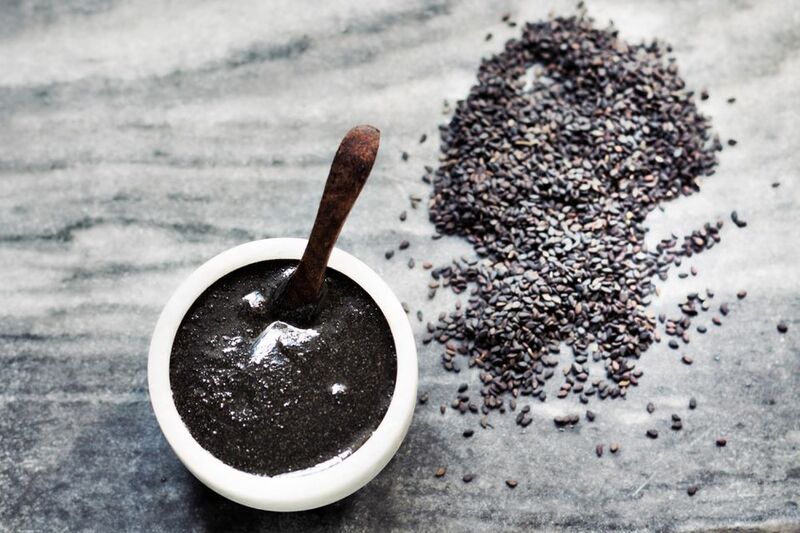 This traditional Chinese sweet soup recipe is made with black sesame seeds and is rumored to help prevent gray hair. It is eaten warm after meals as a dessert or as a mid-afternoon snack and, of course, at dim sum. It's especially popular in Hong Kong and southern China. Feel free to use Chinese rock sugar (available at Asian markets) instead of granulated sugar if desired. While the soup is delicious on its own, for an added touch, it can be garnished with crushed nuts, shredded coconut, or softened chopped Chinese dates. Soak the rice in cold water for at least 1 hour. Toast the black sesame seeds in a frying pan on medium-low heat for 1 to 2 minutes until they are fragrant and the pan begins to smoke. Remove and cool. Drain the rice and add to a blender with 3 cups of the water. Blend until smooth. Remove and clean out the blender. Grind the sesame seeds in the blender until they are fully ground and the sesame smell is very fragrant. Add 1/2 cup of the water and grind briefly until the mixture forms a grayish paste. Add the blended rice/water mixture to the sesame paste and blend. In a large saucepan, bring the mixture to a boil with the remaining 3 1/2 cups of water and the sugar. Serve warm garnished with crushed nuts, shredded coconut, or softened chopped Chinese dates if desired. Once the soup comes to a boil, be sure to stir constantly or there will be splattering and the pot may burn. Add more boiling water to the soup as desired, depending on how thick or thin you want the end result to be.